Do you want to make some noise on your next campaign? Order personalized tambourines from Promo4kids.com. We will make sure that your message is not only seen but also heard by your potential customers with these tambourines. Logo printed tambourines make attractive giveaways during fundraisers, corporate events, store openings, musical fests, school events and more. Most kids love to receive gifts that they can use and keep. 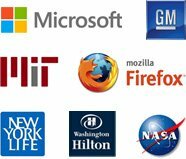 It means your brand logo is going to become the constant companion during their joyous outings. 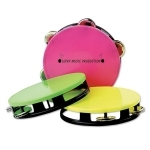 Promo4kids.com stocks a range of promotional tambourines that will add a shrilling touch to your campaign. 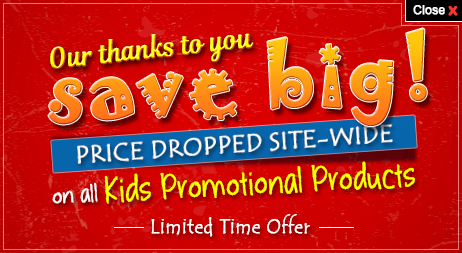 Shop today at Promo4kids.com to avail some attractive price benefits and freebies such as free artwork assistance and free online design proof! 100% customer satisfaction guaranteed. Do you want to make your brand message audible and sound joyous? These custom printed tambourines will allow you to do it without draining your money. These are highly audible and visible way to add a little excitement and fun to any dull event. We will say it is the surefire way to make your next campaign a marvelous hit! 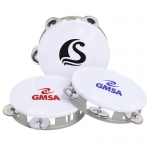 Customized tambourines with your printed logo will become great brand souvenirs that you can gift during tradeshows, pep rallies, kids stores, fashion events and various other joyous occasions. Personalized tambourines printed with your message will become a great party favor item during concerts, Mardi Grass celebrations, holiday parties, weddings and various other special events. As most people love to get little clamorous during gatherings and games but not many items can match the tempo and bass of these tambourines. Do you know like other percussion instruments, tambourines have that special quality to uplift mood and ambience of the event! If you feel that it is going to be a plain, old and boring type of campaign with no fun and only straight faces, you can attempt marketing with these promotional tambourines. We are sure that most of your young customers will appreciate this gift and use them whenever and wherever they can thereby giving a wide exposure to your brand logo that is printed on it. Do you want to add some nostalgia and music to your campaign? You can easily do it with any of these tambourines that were popular during the 60's through the 90's and most kids will use it during musical or dance practices. Promo4kids.com offers a thoughtful collection of tambourines and other promotional giveaways for kids that will add shrill and pitch to your duller campaign. Browse through this selection to find the right kind of product that matches with your requirement and fits into your budget. If you need any assistance on areas from ordering to imprint and shipping, feel free to contact us at 855-454-3786 or you can write to us at info@promo4kids.com.